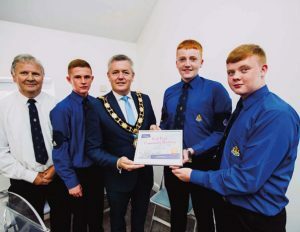 16th Newtownabbey lads win Best Kept Community Planting competition. The 24 August 2018 was judgement day at Antrim Castle Gardens for the ‘Best Kept Gardens Competition’ in Antrim and Newtownabbey. After being shortlisted for their work at Clonmore House Care Home garden in Rathcoole, three lads from 16th Newtownabbey Company won the award for the Best Kept Community Planting 2018. Ben Taylor, Bradley McGarrell and Karl Boyd have been working on the garden since April 2018 as their community service for the Queen’s Badge.